Choose between Eevee and Pikachu for your special Partner Pokémon in Super Smash Bros. Ultimate. It was recently revealed that save data from Pokémon: Let’s Go on the Nintendo Switch will sync with Super Smash Bros. Ultimate to give you a free Partner Pokémon. Depending on the version of Let’s Go you own (Eevee or Pikachu) you’ll be able to immediately unlock that Pokémon's Spirit. Alternatively, you can earn both in-game by completing challenges. For more on how this process works, let’s take a closer look at how to get a free Partner Pokémon in Super Smash Bros. Ultimate. Pokémon: Let's Go owners can instantly get the Partner Eevee Spirit or Partner Pikachu Spirit in Super Smash Bros. Ultimate depending on which version of Let's Go they own. As stated above, gamers who own a copy of Pokémon: Let’s Go, Eevee or Pikachu will be able to sync their save data in exchange for instant access to a free Partner Pokémon. If you own Pokémon: Let’s Go, Eevee you’ll get the Partner Eevee Spirit. If you own Pokémon: Let’s Go, Pikachu, you’ll get the Partner Pikachu Spirit. Wondering what Spirits are in Super Smash Bros. Ultimate? Essentially, Spirits are a new element to Super Smash Bros. Ultimate primarily use in single player. Of course, you can enable Spirits in 2v2 local match and matches in general, but they’re a setting you’ll need to manually enable. In the single-player mode, World of Light, you earn Spirits as you fight, explore, and complete challenges. After unlocking a Spirit, you can equip it to boost certain stats and level up that Spirit, thereby increasing the Spirit’s effectiveness. 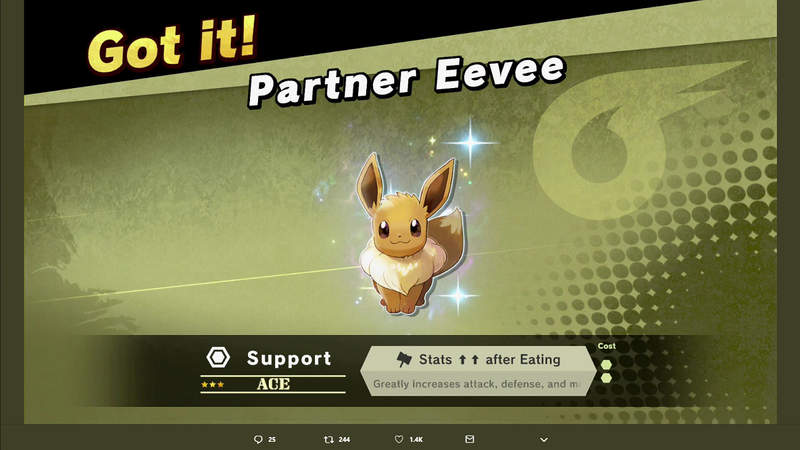 The Partner Eevee Spirit and Partner Pikachu Spirit are both labeled as “Support” Spirits. Despite their similarities, the Partner Eevee Spirit will reportedly increase Attack and Defense, while the Partner Pikachu Spirit will increase your Attack and Move Speed. The Partner Pikachu Spirit and Partner Eevee Spirit can also be unlocked by completing challenges in Super Smash Bros. Ultimate, meaning they're not exclusive to Pokémon: Let's Go owners. To get them in Super Smash Bros. Ultimate, you’ll want to link your Pokémon: Let’s Go save data. In doing so, you’ll unlock the Partner Eevee Spirit or Partner Pikachu Spirit immediately. Don’t own a copy of Pokémon: Let’s Go? No worries, as both can be unlocked by completing challenges in Super Smash Bros. Ultimate according to a tweet from Nintendo. What these challenges will entail has yet to be revealed, though we’ll be sure to update this as players begin unlocking both Partner Pokémon in Super Smash Bros. Ultimate. What do you think Pokémon: Let’s Go owners getting a free Partner Pokémon in Super Smash Bros. Ultimate? Let us know down in the comments below! Super Smash Bros. Ultimate is scheduled to release on December 7 for Nintendo Switch. For more on Super Smash Bros. Ultimate, be sure to check out some of our previous guides including what Spirits are in Super Smash Bros. Ultimate, why Sakurai made Kirby the sole survivor of the World of Light trailer for Super Smash Bros. Ultimate, and the return of Mario in Super Smash Bros. Ultimate! By reading through this guide, you should now know how to get a free Partner Pokémon in Super Smash Bros. Ultimate.